Today a small group of teachers took to the street while principals were being “trained” by mandate into more Teachscape madness. 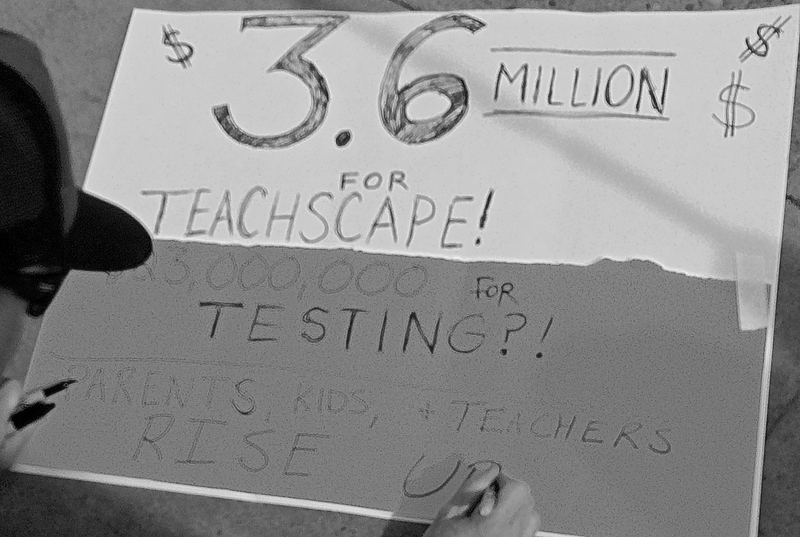 For those keeping score, Teachscape is the millions of dollars system bought into by our state. By the way, the sign here is wrong, 3.6 million is just what the state government bought the license for, add 8-15 million for our district to train and disseminate, plus all the millions more for all of the other districts in New Mexico, now your talking tens of millions, all pouring out of state, and that was just for last year.) All of this for an evaluation rubric that is free to use, on a dilapidated internet infrastructure which could be utterly replaced and improved upon by Google Docs. My last post was what my uncle stood for. The question here is for you. What do you stand for? What is the issue that you would take to the streets for? Education is the pivotal point for so many issues, that it is “that thing” for me. And not just for my own benefit. That is not what steered me into education. I really wanted to do something with my life that I thought was pivotal for many people. The policies don’t affect me directly much, at all. My rating was “highly effective”, which means there are no looming consequences for me. Also, I can step out. I was asked to apply for two other jobs this year, outside of the classroom, by two other institutions that are outside of the impact zone of this policy. My retirement window opens soon, so I could just quietly ride out the storm. Other teachers at this protest are rated as high or higher than myself, of course, we aren’t even allowed to know how the ratings were ascertained. But that isn’t the thing here. The thing is public education, which is absolutely what I believe to be the cradle of our democracy. That is something I will stand up for. These policies are disastrous for public education in our state. In my next post I will document why. It is time for all of us to stand. First go out and vote. And get the word out, by every channel you have, every means. We don’t have the Koch brothers funding us, we have to engage asymmetrically. We have the truth, and this is the time. My Uncle Warren and my father. 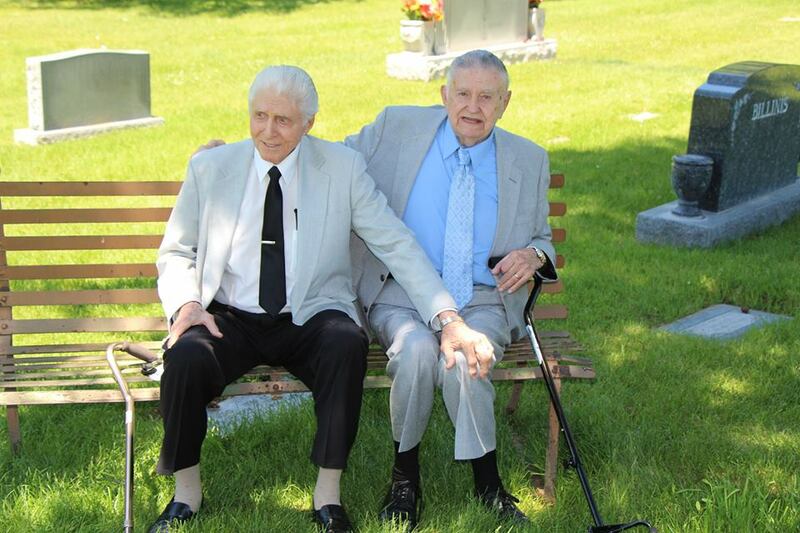 They were best friends, and served in World War two. Part of what Tom Brokaw dubbed “The Greatest Generation”. My Uncle Warren died this year, after his wife, my Aunt Tula died. He came out to visit us in September, part of what I know he knew to be his farewell tour. He told us that. When my mom and I went to the airport to pick him up, he was coming down the jetway in a wheel chair. When he saw us, he asked the stewardess who was pushing the chair, to please stop. He got up, and walked the rest of the way. The rest of the time he was here, he walked. He believed in not showing others his pain. He kept always trying to show strength, and face things with enthusiasm. He smiled in the most dire circumstance. He said things like, “We make our plans, and God smiles”. Another thing he said, “I went looking for myself, but I couldn’t find me. I went looking for God, but couldn’t find he. When I went to help my brother, I found all three.” His funeral was long, and people recounted stories, and it was the first funeral I’ve been to that I never wanted to end. And once again, as he did in life, he brought our family together. My father is waning. The wars he has fought are nothing he has liked to talk much about, and now I think the memory of any of it is gone. Though dubbed “The Greatest Generation”, my father continues to insist his greatest work is his family, his children. And that is a hopeful thing, because I feel the same way about my children. I think we honor the past by building the future. So I wanted to share that with you. Happy Memorial Day. The retirement party for John Malin and Sandra Dexter will be Wednesday May 21st, from 1 to 3 pm in the Library of Monte Vista, please come if you would like to be a part! Food will be provided. Movies & popcorn for kids!